Synthetic peptide conjugated to KLH derived from within residues 150 to the C-terminus of Human SNAP25. Recombinant Human SNAP25 protein (ab51048) can be used as a positive control in WB. This antibody gave a positive signal in the following lysates: Spinal cord (Rat) tissue lysate and Hippocampus (Mouse) tissue Lysate. ICC/IF: PC12 cell line. Our Abpromise guarantee covers the use of ab41455 in the following tested applications. WB Use a concentration of 1 µg/ml. Detects a band of approximately 26 kDa (predicted molecular weight: 23 kDa). ab4455 staining SNAP25 in PC12 cells. The cells were fixed with 100% methanol (5 min) and then incubated in 1%BSA / 10% normal goat serum / 0.3M glycine in 0.1% PBS-Tween for 1h to permeabilise the cells and block non-specific protein-protein interactions. 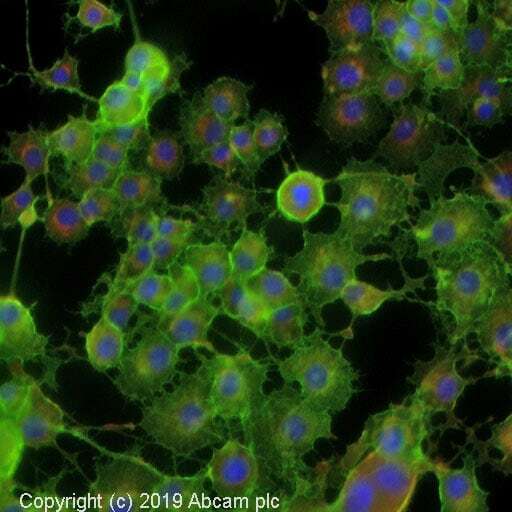 The cells were then incubated overnight at +4°C with ab41455 at 5ugml then detected with an Alexa Fluor® 488 goat anti-rabbit secondary antibody (ab150081) at a 1/1000 dilution (shown in green). Nuclear DNA was labelled with DAPI (shown in blue), and ab195889, Mouse monoclonal to alpha Tubulin (Alexa Fluor® 594), at a 1/250 dilution (shown in red). ab41455 staining SNAP25 in rat brain tissue section by Immunohistochemistry (PFA perfusion fixed frozen sections). 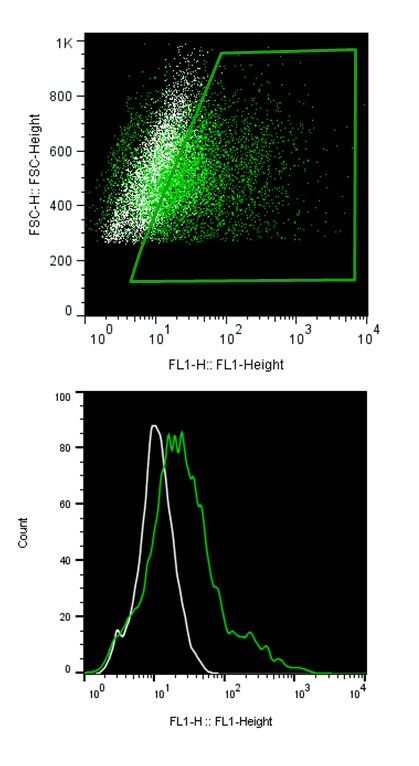 Tissue from 4% PFA perfused animals underwent overnight fixation in 4% paraformaldehyde, cryoprotected in 30% sucrose and cut using cryostat.The primary antibody was diluted, 1/3000 (PBS + 0.3% Triton X100) and incubated with sample for 18 hours at 20°C. An abcam antibody ab60314, Chromeo488 conjugated goat polyclonal to rabbit IgG, diluted 1/1000 was used as secondary. 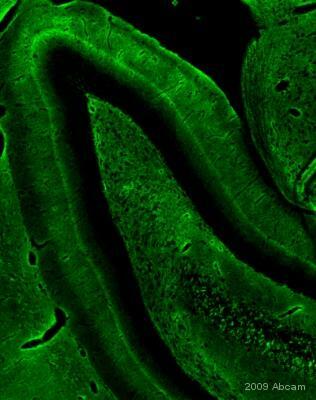 The picture shows the staining obtained at the level of the hippocampus. The staining was very strong, located in the whole brain. SNAP25 was immunoprecipitated using 0.5mg Rat Spinal Cord tissue lysate, 5µg of Rabbit polyclonal to SNAP25 and 50µl of protein G magnetic beads (+). No antibody was added to the control (-). The antibody was incubated under agitation with Protein G beads for 10min, Rat Spinal Cord tissue lysate lysate diluted in RIPA buffer was added to each sample and incubated for a further 10min under agitation. Proteins were eluted by addition of 40µl SDS loading buffer and incubated for 10min at 70oC; 10µl of each sample was separated on a SDS PAGE gel, transferred to a nitrocellulose membrane, blocked with 5% BSA and probed with ab41455. Publishing research using ab41455? Please let us know so that we can cite the reference in this datasheet.